I guess like a lot of people my age, over the years my weight has creeped up. To be honest with you my weight has been the least of my worries in recent years what with my son’s medical condition and the loss of my Grandad, my father, my ex-husband and my beloved dog all within the space of 18 months! I have said all along that I would get the weight off when I’m ready to and not before. Now is that time! I did join Weight Watchers online a few years ago ( well, I had no intention in going to “fat club” to be told I’m fat!) and found that I really did lose the weight. In total I lost just over 3 and a half stone which was the equivalent of 5 dress sizes! Unfortunately the tail-end of this weight loss coincided with the onset of clinical depression. I have since read that high levels of artificial sweeteners such as those found in “diet food” are linked to clinical depression. Now I’m not saying for one minute that losing weight caused my breakdown but it may well have been a contributing factor. You can understand my apprehension, therefore, on embarking on a weight loss programme. Fitness wise, I feel I’m doing OK. I walk my whippets everyday for at least an hour and let’s face it they don’t walk slowly! I would love to go to the gym but unless I can be in two places at once it is simply not going to happen! Physically I am very strong and any medical issues are due to injury rather than sickness. I have a shoulder that dislocates at will which was courtesy of my son falling on me and a dodgy knee following a car crash. I’m not doing too bad though! One of my biggest issues with dieting is that I do have a sweet tooth. We always have something sweet after our evening meal but I refuse to buy “diet” cakes and puddings. These guilt free brownies, however, don’t contain artificial sweetener. They use fructose (fruit sugar) which is completely natural and cannot be metabolised by our body in the same way as glucose and sucrose. It is also incredibly sweet so you don’t need to use very much of it. It is readily available in most supermarkets these days too. This recipe is also fat-free and has the added bonus of having lots of fibre in it. What is the secret ingredient? Prunes! Yes, you read that right! 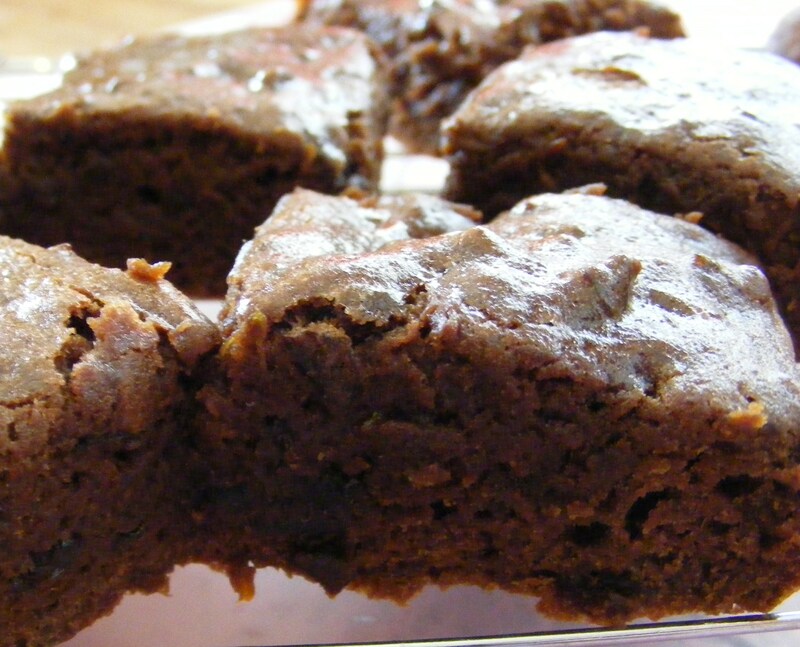 It uses pureed prunes as its base which keeps the brownies lovely and moist without the addition of lots of fat. These are not the gorgeous, gooey Heavenly Brownies that I usually make. let’s face it, you put on a stone just reading the recipe for those! No, these are much denser and more filling than those heavenly delight but equally as good and at least I can have a piece of brownie after my tea and not feel guilty about it! Preheat the oven to 160 C fan/ 180 C / 350 F.
Line an 8 inch square tin. Place the prunes in a bowl and pour over the hot water. Leave for at least 10 mins then puree with a blender. Seperate 2 of the eggs then place the extra whole egg and the yolks into a mixing bowl. Add the sugar and beat until pale and thick. Stir in the melted chocolate and prunes. Then mix in the flour. Whisk the remaining egg whites until the soft peak stage then fold into the chocolate mixture with a metal spoon. Pour into the prepared tin and bake for 12-15 minutes.